As I was taking the time out of a busy day to prepare this blog today, it dawned on me how much time I've spent on this site for the past four or so years. There are so many blogs on the internet these days that it can sometime seem like the virtual world is over-saturated and then some. It seems so easy log on to Blogger or Wordpress and start your very own little publication sphere. I think in a way, this has undermined how much dedication it takes to consistently run a blog. For my part, I know that sometimes, no matter how much I love interacting with readers and how much I love sharing my passion for food, I really have to pull through to get a blog post up. As Chocolate Shavings has steadily grown, I sometimes find myself being too much of a perfectionist. There are so many dishes that don't make it on to this blog because I feel like I haven't gotten my recipe exactly where I want it or because I feel like the photos I just took of a dish do not do it justice. There have definitely been countless, countless times where food had been brought to the table at room temperature because I wanted to take the very best shot I could. All this is to say that sometimes it's easy to take a blog for granted - to quickly browse through a couple pages of a blog, maybe bookmark a recipe or just glance over recent content. I've done it, and I'm sure you have too. The term 'blogging' often gets a bad reputation as well. There is a sense that anybody could be a blogger, that anybody can jot down their thoughts of the day and quickly press 'publish' for the world to see. But being a dedicated, regular blogger really does take time It's often like running your own mini magazine, alone and to offer the content free of charge for all to enjoy. My goal with this post is really just to give fellow bloggers a real pat on the back. The realm of blogging was just a hobby when I started during college and has, in many ways, help me jump-start my career. It's what made me want to go to culinary school, what gave me the continued dedication to write on a regular basis and what got me my first commercial photography job. I owe a lot to the blogging world, and this is my small way of giving back. 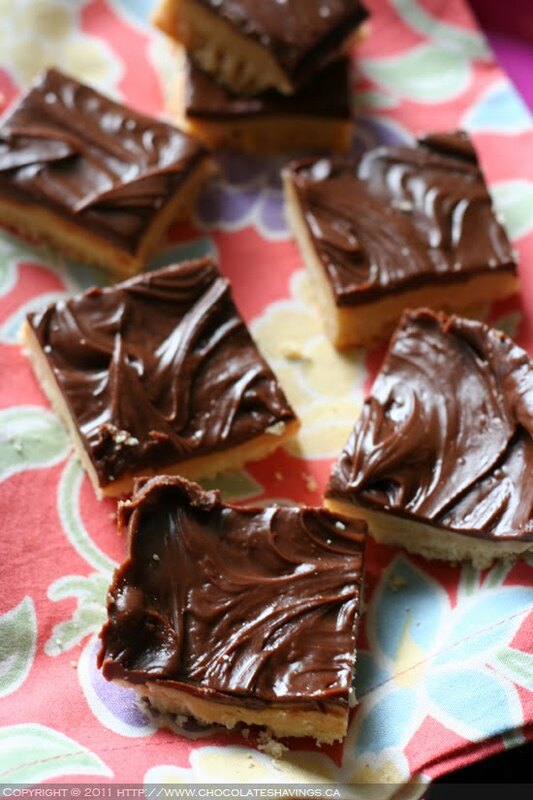 So why not indulge with a slice of Millionaire's shortbread? Butter 2 (8-inch) square nonstick pans and coat with flour, tapping off excess. Place the flour, sugar and salt in a food processor and pulse once. Add butter and pulse until mixture resembles peas. Press the shortbread mixture into prepared pans and bake until golden brown around the edges, about 20 minutes. Remove from the oven and let cool completely. In a heavy-bottomed saucepan over medium-low heat, combine the condensed milk and 2 tablespoons of butter. Slowly bring the mixture to a boil, stirring continuously. Continue stirring over the heat until mixture becomes thick and amber in color, about 15 minutes. Pour the caramel over the cooked shortbread and spread evenly using an offset spatula. Cool to room temperature. This is such an affirming post. A breath of fresh air. Blogging, I've found, is a humbling and vulnerable process. We put our passions and ideas on display to share, interact, and inspire with the hope that someone, somewhere, will walk away from their computers after visiting our site feeling enlivened or empowered. While there is a proliferation of blogs today, I think that it is more of a sign that people wish to be heard. They wish to connect with people who think like them, who challenge them, who have the same goals. It's amazing that if someone isn't getting that in "real" life, blogs can serve as a bit of a buoy. Thanks for the recognition. I've been blogging for about three years. I am thrilled with the feedback and the online friends I have made. I did hope that by now I would have more followers/subscribers, but then I guess I'd have more pressure to produce. I enjoy my little blog and I'm glad others do too. I agree with some of Karen's thoughts. I've been blogging three years next month and it's been a fabulous experience and I've made so many wonderful friends along the way. However, the word "blogger" does have somewhat of a bad reputation. I mentioned to someone that I was a food blogger and her response was "I don't read blogs," like they were something distasteful. Now I say I am a food writer and hold my head up proudly. Your shortbreads look fantastic and the photo is amazing. Would make a lovely cover to a cookbook don't you think. Sam: I agree, people tend to stick to labels and what they believe they stand for, which is in part what inspired me to write this post! I love this post! I've only been blogging for about 8 months, and I kind of compare it to the best part time job I've ever had, except I don't get paid for it, monetarily that is. I love every part of blogging, from cooking the food to the pictures to the writing. The people I've met and the lessons I've learned along the way have only enriched my blog, and well, my little ol' life. As far as your shortbread goes, I haven't had this in years. My mom made it when we were kids and I remember eating half the pan in one sitting. Ah, memories! I love reading blogs and interacting with people all over the world. What better way to do this? While munching chocolatey desserts! Heaven! i need to jump on the shortbread bandwagon. can you believe i still have yet to make it? yours look diving!!! Kim: you should give it a try! It's the perfect buttery, indulgent treat! Very well said! It does take a lot of time to run a blog, and I think a lot of people don't realize that. As for the shortbread, I'm craving it as much today as I was yesterday. Want!